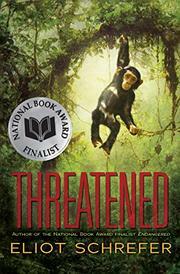 The author of Endangered (2012) introduces another primate species, offering a poignant demonstration of connection between chimpanzees and humans. When AIDs orphan Luc goes into the Gabon jungle with professor Abdul Mohammed, a scientist who frees him from his bondholder and plans to study chimpanzees in the wild, the resourceful boy finds a surprising new family and makes a real home. Luc’s story is riveting and seldom comfortable, for him or for his readers. The chimpanzees are aggressive, but they are not as lethal as the leopard or as personally dangerous as the bushmeat hunter the professor frightens away or Monsieur Tatagani, determined to return Luc to his stable of street boys. Drummer, the young male chimp Luc rescues from a trap, and Mango, his toddler sister, have personalities as real and appealing as the boy himself. Luc’s first-person narration is so lively and detailed readers won’t notice that he seems remarkably acute for a 12- or 13-year-old, even one who has watched his mother and baby sister die and lived, afterward, by his own wits. The particulars of his daily life Inside—where Gabonese believe humans shouldn’t go—will enthrall those who enjoy adventure, and the intimate glimpse of chimpanzee daily life is a treat for nature lovers.